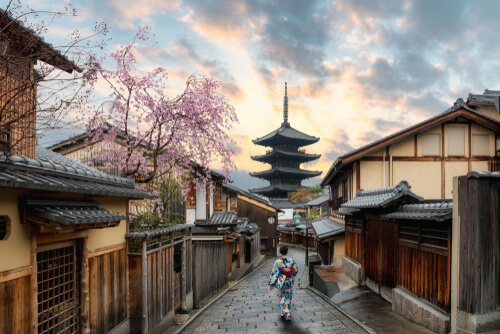 While its eclectic capital Tokyo exudes modernity and is one of the most technologically advanced cities in the world, there are many prefectures throughout Japan that resemble their traditional forms with wooden minka architecture and torii gates on every street. What sets Japan apart from the west is the diversity of its natural and culinary landscape that changes at different times of the year. Shun (pronounced shoon), is the Japanese principle that ingredients should only be eaten when they’re at their peak in terms of flavour and freshness. While genetic modification now ensures that most fruit and veg is available year-round, out of season goods are often pumped with preservatives and chemicals to retain freshness. Shun, on the other hand, promotes the consumption of foods when they’re at their prime. Shun is said to date back thousands of years and was derived from the indigenous religion of Shinto, which traditionally emphasises man's connection with nature. In addition to its impact on food, shun has resulted in the creation of many seasonal matsuri (festivals), such as hanami (the celebration of blooming flowers) and the planting and harvesting of crops. After centuries of observance, these festivities and the anticipation of each season has become deeply entrenched in Japanese culture. From December to February, fuyu turns much of Japan white. As the temperature drops, so do visitor numbers but for those prepared to brave the cold, winter really is a fantastic time to explore the country. 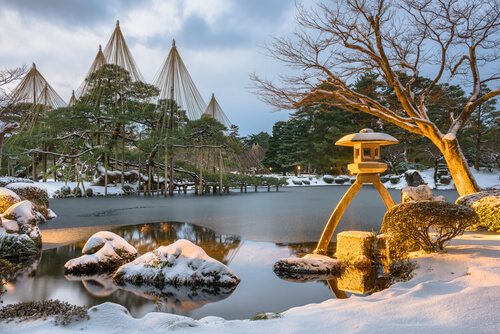 Places like the Kenroku-en Gardens of Kanazawa are at their most breathtaking when covered in snow. Daylight hours are shorter, so it pays to rug up and get started early. If you’re not a morning person, don’t fret – some of the country’s most beautiful winter landscapes are best viewed once the sun has gone down. The UNESCO World Heritage listed village of Shirakawago is illuminated every winter evening and seeing hundreds of traditional gassho-style houses blanketed in snow is truly magical. Warm, hearty dishes reign supreme during the Japanese winter with ramen and udon the most popular. 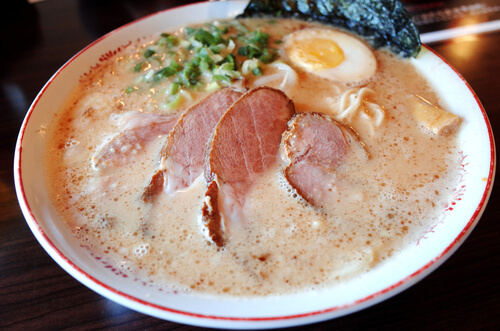 While their flavours vary according to the region, tonkotsu (pork broth) ramen with chashu (pork belly) dominate menus thanks to its richness. Alpine areas that experience the coldest temperatures like Mount Fuji and Sapporo favour nabe (hot pot), which utilise local ingredients like kombu (kelp) and salmon. Spring marks the start of cherry blossom season, undoubtedly the most popular time of the year to visit Japan. Between late March and early April, many of the country’s most famous sights like Himeji Castle in Hyogo are bestrewn in delicate sakura (cherry blossom) petals and hanami (flower) viewing parties fill the local parks. In addition to sakura, all kinds of flora thrive in the mild temperatures and sunny spring days including tulips, azaleas and wisteria. The latter is the star of one of Japan’s largest flower matsuris (festival), the Great Wisteria Festival at Ashikaga Flower Park in Tochigi, two hours from Tokyo. Many large celebrations are held in the spring such as the Sanno Matsuri or Takayama festival, which attracts thousands of visitors. Dating back to the 16th century, the event is held to pray and give thanks for a good harvest. Over two days, elaborate yatai floats decked out in gold and complete with marionette dolls, are paraded down the street. Watching them trail down the main street of Takayama, past dozens of blooming sakura trees, is a magnificent experience. Fresh fruits and vegetables like ichigo (strawberries) and takenoko (bamboo shoots) dominate meals, while seasonal seafood such as clams and bream are hugely popular in Japan’s coastal regions. Spring also sees the emergence of sakura-flavoured treats: mochi (rice cake), soft-serve ice cream and even Kit Kats (the milk chocolate version won’t cut it after you taste this). Running from June to August, summer tends to kick off with a short rainy period before turning hot and humid. Adventurers rejoice in the Japanese summer as it marks the beginning of the official hiking season of the country’s peaks, including Mount Fuji. Mountainous regions tend to enjoy a mild climate during the summer and places like Hokkaido flourish rather than wither. 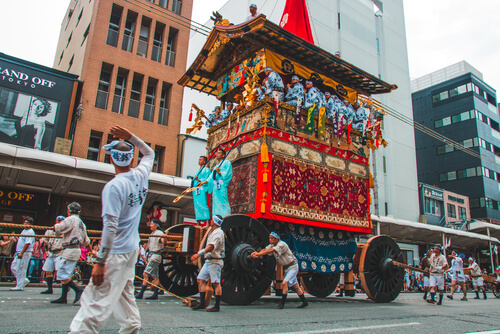 While the big cities can get a little uncomfortable, summer is the best time of year to experience Japan’s vibrant matsuri culture, and most visitors agree that it’s worth enduring the humidity in exchange for the spectacular displays. One of the biggest festivals is the Gion Matsuri, which takes place in Kyoto for the whole of July. The matsuri was originally a prayer for salvation from plague but has evolved into a celebration of traditional Japanese culture. For the past one thousand years, the streets of Kyoto have been transformed into a joyful spectacle of people, parades and fireworks. Food in summer is refreshing and typically cool to combat the sweltering temperatures. 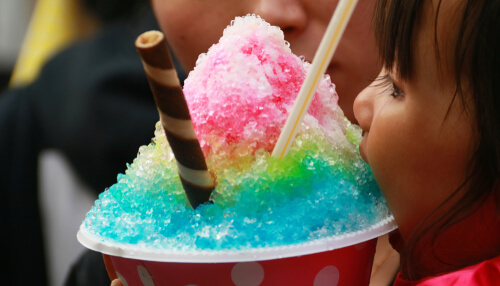 Think: cold soba noodles and kakigori (shaved ice) for dessert. Unagi or grilled eel is also popular, not for its seasonality, but for its historical connection to the season. Legend states that in the 18th century, a samurai advised a restaurant owner struggling with summer sales, to tell customers it was the ushi no hi (day of the ox) and they should eat food beginning with ‘u’ to combat the heat. As strange as it sounds, the practice caught on, and unagi has become synonymous with summer. The autumn months of September to November attract visitors to Japan for koyo, when leaves turn to vibrant shades of crimson and yellow. Cities like Kyoto and Hakone undergo the biggest transformation due to the thousands of maple and ginkgo trees found here. 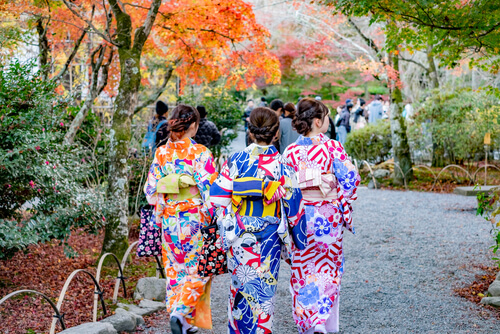 Japanese gardens such as Shukkeien in Hiroshima or Kenroku-en in Kanazawa, are picture-perfect in autumn and are well worth braving the crowds to see. The mild to cool climate of a Japanese autumn means sweet potato, mushrooms and chestnuts thrive and are widely available everywhere. Autumn also coincides with several big food festivals including the famous Tokyo Ramen Show, featuring every iteration of the soupy noodles you can imagine, and the Hokkaido Food Festival, celebrating over 400 dishes from the gourmet north of Japan.